I don’t know about you but am I the only blogger who wishes they had cottoned onto all of this blogging malarkey about three or four years (maybe five or six) before they actually did? The reason that I have been thinking about that is that I could have shared my thoughts on so many other books with you all, one such book would be on that Granny Savidge Reads made me purchase and was ‘The Vanishing Act of Esme Lennox’ by Maggie O’Farrell which we both thought was marvellous. However I can share my thoughts with you on the latest which I was rather delighted to get an advance copy of. First off I should say it will be hard to do this book justice full stop, it will also be hard to say too much without giving everything away and spoiling it for the reader. 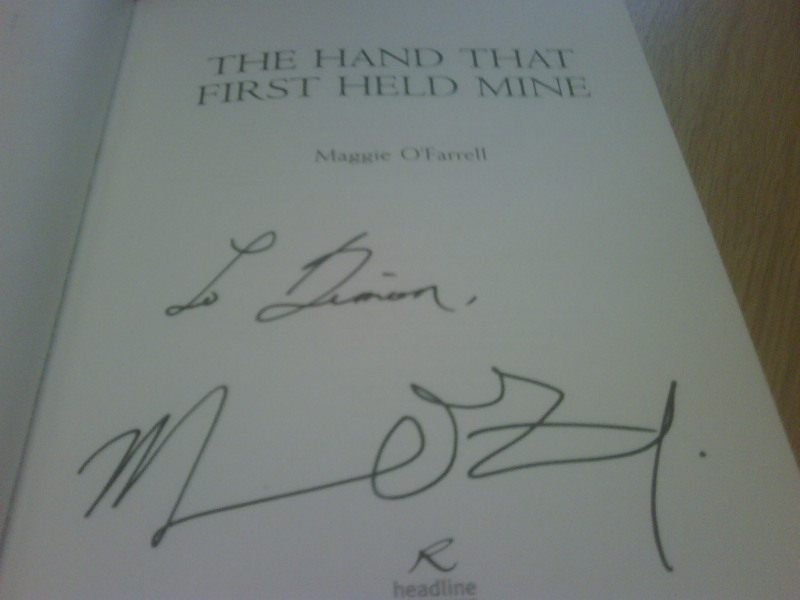 There are two main stories running through ‘The Hand That First Held Mine’. One is the story of Lexie a recently graduated student who finds herself back at home in rural Devon with her family and younger siblings. When she finds Innes Kent spying on her over her garden wall she soon finds her chance to escape and ends up in the midst of the streets of London’s Soho during the bohemian 1950’s and part of a rather unconventional, but very touching for the reader, love story. The other story set in the present day is of Elina, a woman who has not long had a baby though she cannot remember the birth at all one minute she was pregnant the next there was a baby by the bed, and her husband Ted who knows what happened and doesn’t want to tell her. 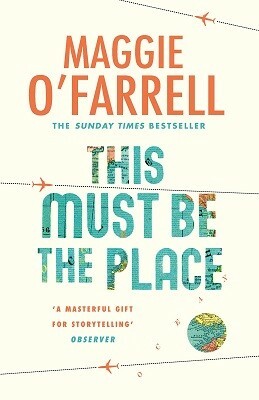 As the book goes on O’Farrell very carefully allows us glimpses into these two very different worlds slowly filling in the blanks and adding in some subtle twists, plotting and weaving the two stories together slowly revealing how they are connected. I make it sound like there is no plot, there is – well there are two, I just don’t want to spoil anything for the reader. I will say I found both stories incredibly readable, you want to know what happens with both couple for very different reasons as there are things left unsaid and tensions bubbling under the surfaces. Some reviews I have seen have bemoaned that the connection is too obvious but I didn’t really start to figure it out until two thirds of the way through. However this isn’t a mystery story for the reader to figure out it’s a tale of two wonderful female leads and their lives, though readers might like to be prepared for some shocks and the possible need for some hankies. It is also about the characters around them, for example Lexie has a wonderful strong willed landlady and Innes’ ex’s while Elina has a matriarchal mother-in-law to contend with. I now rather desperately want to read the rest of Maggie O’Farrell’s work even more than I did after reading ‘Esme’, especially after I saw her talking, despite a cold, at Foyle’s on Tuesday with Lionel Shriver. I am wondering if Maggie O’Farrell is eligible for the Man Booker if so I wouldn’t be shocked, rather delighted in fact, to see this getting long listed. As to her previous works what would you recommend? I have to say I might pace myself as I think they will be books to treasure and I don’t want to run out of them.